In order to maintain my anonimity (more or less, anyway) I've made changes to my Sitemeter and Haloscan accounts. This unfortunately means that all the comments and trackbacks have went away. Sorry about that--I hope none of my commenters or trackbackers are offended. The key of the future? Wired has this article on just how easy it is to hack RFID. It seems to me that all we'll be doing is making identity theft easier and less dangerous. Big bad terrorist Abu al-Zarqawi, who hates everything western, wears New Balance tennis shoes, rides around in a pickup truck and has poor weapons skills. So much for Super Jihadist. Tapes siezed by US troops in Iraq are supposed to be a veritable blooper reel of weapons mishandling, general ineptness and hypocrisy. I can't find the full video anywhere; the best I can do is this infuriating CNN story that shows some of the video. I do love the part where he muzzle sweeps a couple of his comrades. Pity he didn't have a fit of poor trigger discipline to go along with the poor muzzle discipline. The video is infuriating because the spineless reporter is actually apologizing for al-Zarqawi's poor showing with the weapon. "It's a very heavy machine gun," and "It has a very heavy trigger and I'm not surprised that he couldn't get it to shoot automatically." Rope. Tree. Traitorous journalist. Some assembly required. My question is where the dickens did he get an M-249 SAW and a M-4 with an M-203 grenade launcher? A person with an Energy Department security clearance. An 82-year-old veteran who says he's never even had a traffic ticket. A high-ranking government employee with a better-than-top-secret clearance who is also a U.S. Army Reserve major. A retired U.S. Army officer and antiterrorism/force-protection officer with expertise on weapons of mass destruction who was snared when he was put back on active-duty status while flying on a ticket paid for by the Army. But there are over 400,000 people on this list. Now I'm here to tell you, if there were that many terrorists, we be bumping into them every time we went out to lunch. They'd be causing mass havoc in this country every day. I don't object to the list, per se. But I do object to a stupid list that is so big that it's worse than useless. It doesn't make us safer, it just inconveniences us, causes problems and pisses people off. Then again, that what you usually get from government bureaucracies. Three weeks or so ago, I noted the filing of a lawsuit by the EFF over alledged massive wiretapping by the NSA. The Feds are invoking common law privilege of "state's secrets" in an attempt to kill the suit. Feel free to tell me to don an extra layer of tinfoil if you like, but I'm taking this as confirmation of what they've been up to. If you watch TV, listen to the radio, make phone calls or use a "communications service", prepare to get shafted--the new telecom bill has been introduced. As you might expect, this law is going to further stick the combined fingers of the government, the movie industry and the recording industry into our pockets and our lives. Just lovely. I'm waiting to see what the penalties for violations will be--civil asset forfeiture has been discussed. 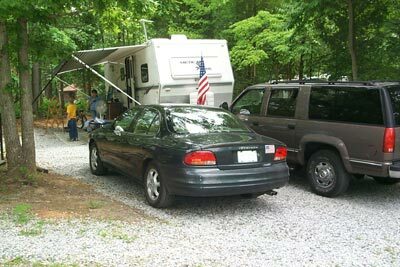 The Freeholder family has now officially moved the RV to it's summer digs at our campground. Time for blogging to slow down a bit, as I make time for family, friends, fishing and range trips. Especially range trips with family and friends. And for those of you who are curious, this is Camp Freehold. And yes, I know it isn't really camping. It's a hell of a lot more comfortable. You come off the range on a 95o day and tell me that a 72o room with cold drinks, a TV and a comfy chair doesn't sound good!